The Big Move: Weather Station is GO! 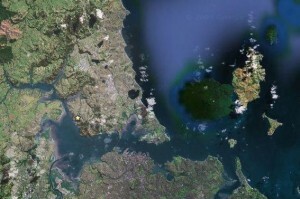 Okay – after a bit of fnarkling, we’re back with Temperature, Humidity as well as that ever useful Wind and Rain data. Not only are we transmitting in elegant Flash interactivity, we’re also on Twitter – should that be your thing (note, this is currently set to tweet every 15 minutes). So – there we go, weather data is being captured, next steps (after house wiring) is to get a live weather cam up and running so you too can enjoy our lovely view. Author Rob the GeekPosted on March 18, 2010 March 18, 2010 Categories Geek Stuff, Home Network, Twitter, Weather StationTags Home Network, La Crosse, Temperature, Twitter, Weather, Weather Station, Weather Station Tags: Home Network1 Comment on The Big Move: Weather Station is GO! 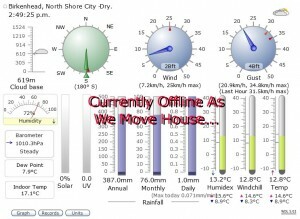 The Big Move: Weather Station BACK! Over the last week I’ve managed to run some power to a nearby cupboard where the La Crosse WS2300 LCD has been sitting and I’ve now got a PC in there gathering the data, and spitting it out to the Weather Page via a very slow WiFi link. 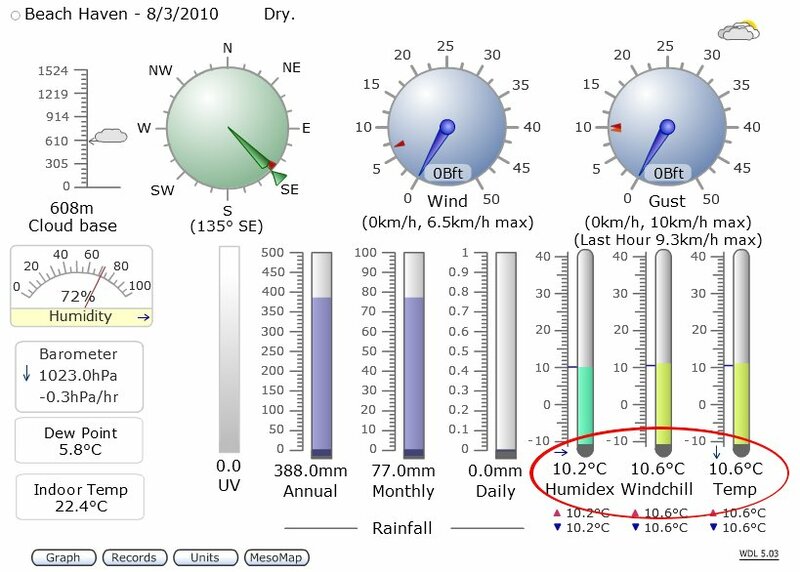 The biggest stinker about this is the external temperature/humidity sensor is not producing data, giving me a flatline of 10.2 degrees C, which I assume can only be a remnant of the last data held when the station was disconnected back in June 2009 in preparation for the house move. So, while there is some data being delivered, it’s not quite 100% – or that interesting due to the lack of the outside temperature. I’ve raised a ticket with the excellent folk at Scientific Sales where I bought the unit and hopefully, they will be able to suggest a remedy which won’t involve too much expense. 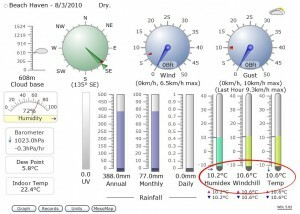 Until then, bask in the oh so interesting data of wind direction and speed, as well as the temperature inside the cupboard in which the data logger is stashed. The Big Move: Weather Station DOWN! It’s winter in Auckland, New Zealand – it’ll either be cold and raining or cold and crisp. Author Rob the GeekPosted on June 17, 2009 June 17, 2009 Categories Geek Stuff, Home Network, Weather StationTags Home Network, Weather, Weather Station2 Comments on The Big Move: Weather Station DOWN!